Peter Bergen is CNN’s national security analyst, a vice president at New America, a professor of practice at Arizona State University and the author of “Manhunt: The Ten-Year Search for bin Laden from 9/11 to Abbottabad.” View more opinion articles at CNN. (CNN) Running the Department of Homeland Security (DHS) may be the toughest job in the federal government. The DHS is a sprawling giant of 22 agencies that merged together in the wake of 9/11. The department’s 240,000 employees handle everything from hurricanes to cyber security to border security to terrorism. As secretary of homeland security, a lot of things can happen on your watch: A botched response to a hurricane, or a serious cyber attack, or a major terrorist assault, or rising numbers of migrant families trying to cross the southern border. That’s why in the past the top job at DHS has gone to a party elder skilled in politics, such as the former governor of Arizona, Janet Napolitano, who served in the role during President Obama’s first term or, the former governor of Pennsylvania, Tom Ridge, who served under George W. Bush. If it wasn’t a skilled politician who took the top DHS job, it went to officials who had served at the highest levels of policy-making or the US military such as the Bush-appointed Michael Chertoff, who ran the criminal division at the Department of Justice where he oversaw the investigation of the 9/11 attacks. During his second term Obama appointed Jeh Johnson, who had been the top lawyer at the Pentagon, while Trump appointed Gen. John Kelly, the former four-star general in charge of Southern Command, which is responsible for all US military operations in Latin America. 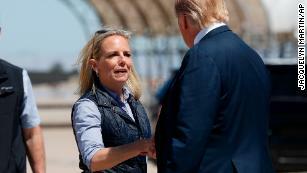 Kirstjen Nielsen was neither a political heavyweight nor had she served in senior policy or military roles when she took over DHS. Nielsen had worked at the George W. Bush White House in a relatively junior role for three years and then had gone into the private sector for more than a decade. When Kelly was tapped by Trump to run DHS, Nielsen was appointed to be his “sherpa” during his confirmation process. Kelly was impressed and made Nielsen his chief of staff at DHS. When Kelly moved to the White House to serve as Trump’s chief of staff, Kelly brought Nielsen over to be his deputy. 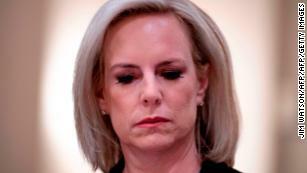 Kelly then pushed for Nielsen to take over DHS. Like so many other top Trump officials, Kelly was eventually forced out and in December he left the White House. Kelly had served as a heat shield for Nielsen, who sometimes bore the brunt of Trump’s ire. The President blew up at her at a Cabinet meeting last spring because she was hesitant to sign a memo ordering migrant children to be separated from their parents, according to the New York Times. In October, Kelly and national security adviser John Bolton had a curse-laden shouting match at the White House about the rising number of migrant crossings at the southern border. Bolton told Kelly that Nielsen needed to do her job, which led to the heated argument in which Kelly defended his former deputy, according to CNN. With Kelly gone, Nielsen no longer had an advocate at the White House. She became Trump’s scapegoat for the rising number of migrant families trying to cross the southern border in recent months. Many of those families are fleeing the violence and economic travail of Guatemala, Honduras and El Salvador, and there isn’t much that any DHS secretary can do to try to stem the flow of migrants willing to leave everything behind to seek a better future in the United States. Almost a century ago one such desperate migrant, Mary Anne MacLeod, left the Outer Hebrides islands of Scotland, one of the most poverty-stricken parts of Europe, to find work as a servant in New York. Mary later married Fred Trump. They had five children, including a son named Donald. Trying to dissuade migrants such as Mary Anne MacLeod from leaving countries where they see no future to seek their fortune in the United States is likely beyond the ken of any secretary of homeland security.